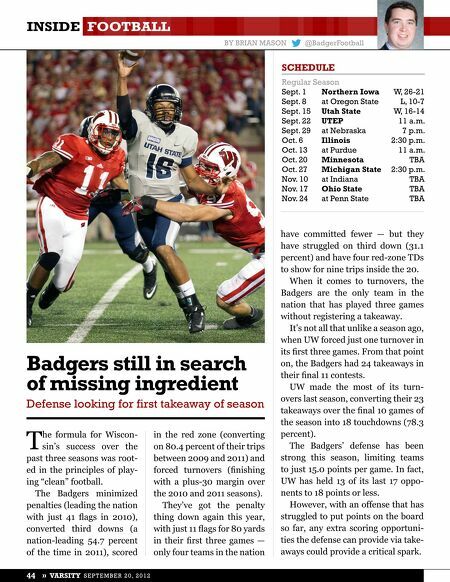 INSIDE FOOTBALL BY BRIAN MASON @BadgerFootball SCHEDULE Regular Season Sept. 1 Sept. 8 Northern Iowa W, 26-21 at Oregon State L, 10-7 Sept. 15 Utah State Sept. 22 UTEP Sept. 29 at Nebraska Oct. 6 Illinois Oct. 13 at Purdue Oct. 20 Minnesota Oct. 27 Nov. 10 Nov. 17 Ohio State Nov. 24 W, 16-14 11 a.m. 7 p.m. 2:30 p.m. 11 a.m. TBA Michigan State 2:30 p.m. at Indiana at Penn State TBA TBA TBA have committed fewer — but they have struggled on third down (31.1 percent) and have four red-zone TDs to show for nine trips inside the 20. When it comes to turnovers, the Badgers are the only team in the nation that has played three games without registering a takeaway. It's not all that unlike a season ago, Badgers still in search T he formula for Wiscon- sin's success over the past three seasons was root- ed in the principles of play- ing "clean" football. The Badgers minimized penalties (leading the nation with just 41 flags in 2010), converted third downs (a nation-leading 54.7 percent of the time in 2011), scored 44 » VARSITY SEPTEMBER 20, 2012 of missing ingredient Defense looking for first takeaway of season in the red zone (converting on 80.4 percent of their trips between 2009 and 2011) and forced turnovers (finishing with a plus-30 margin over the 2010 and 2011 seasons). They've got the penalty thing down again this year, with just 11 flags for 80 yards in their first three games — only four teams in the nation when UW forced just one turnover in its first three games. From that point on, the Badgers had 24 takeaways in their final 11 contests. UW made the most of its turn- overs last season, converting their 23 takeaways over the final 10 games of the season into 18 touchdowns (78.3 percent). The Badgers' defense has been strong this season, limiting teams to just 15.0 points per game. In fact, UW has held 13 of its last 17 oppo- nents to 18 points or less. However, with an offense that has struggled to put points on the board so far, any extra scoring opportuni- ties the defense can provide via take- aways could provide a critical spark.